Shelf sand banks and linear sand ridges are found on numerous modern and ancient continental shelves where sufficient sand exists and currents are strong enough to transport sand-sized sediment (Off 1963; Snedden and Dalrymple 1999; Dyer and Huntley 1999). Sand banks and linear sand ridges are defined as all elongate coastal to shelf sand bodies that form bathymetric highs on the seafloor and are characterized by a closed bathymetric contour (Fig. 1). Other terms used to refer to these specific bathymetric features include linear shoals, shoreface ridges, shoreface-attached or detached ridges, shoreface-connected or disconnected ridges, tidal current ridges, and banner banks. Typically, these linear sand bodies have heights that are more than 20% of the water depth, lengths that range from 5 to 120 km, relief up to 40 m, and side slopes that average < 1°. They are 0.5–8 km wide, asymmetrical in profile, and consist of unconsolidated fine-to-coarse sand or even gravel. Axes of these sand bodies are generally oriented shore-parallel, shore-oblique (10–50°), or shore-normal when compared to the adjacent coastline, but any orientation is possible. Sand banks and linear sand ridges are present in a wide range of water depths and found in estuaries, at tidal entrances, adjacent to coastlines (offshore headlands, spits, and barrier islands), on the exposed shelf, and along the continental shelf edge. Moreover, these sand bodies usually occur in groups with spacing of individuals on the order of 250 times the water depth, but solitary ridges do occur (Snedden and Dalrymple 1999). Two or more linear ridges grouped together are referred to as a sand ridge field, but other terms like ridge and swale topography are also used. Initial investigations regarding bathymetric irregularities on continental shelves date as early as the 1930s (Van Veen 1935; Veatch and Smith 1939). Since that time, investigations into the origin, morphology, and geology of sand ridges may be organized into three groups: (1) morphology and surficial sediment studies (e.g., Off 1963; Uchupi 1968; Duane et al. 1972); (2) genesis and hydrodynamic regime (e.g., Swift and Field 1981; Huthnance 1982; Swift 1985; McBride and Moslow 1991; Snedden and Dalrymple 1999), and (3) internal geology and stratigraphy (e.g., Penland et al. 1989; Snedden et al. 1994; Dalrymple and Hoogendoorn 1997). Many different classifications have been proposed for sand banks and linear sand ridges but the three most widely accepted are highlighted here. 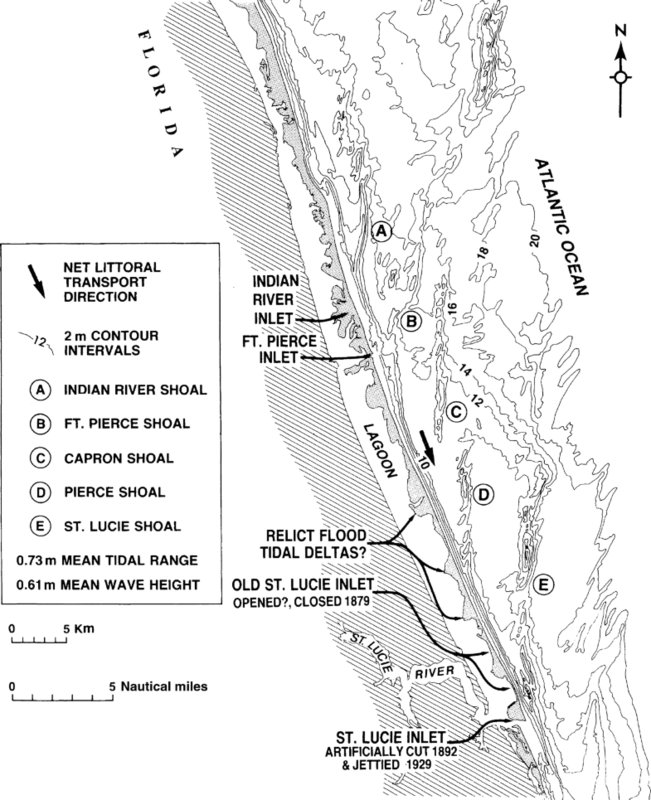 By the 1980s, leading investigators had classified linear sand bodies on continental shelves into two types – storm or tide built (Amos and King 1984; Swift 1985). In other words, either storm-generated or tide-generated currents were primarily responsible for ridge development and maintenance. Through time, however, researchers also recognized the importance of ridge precursors (i.e., sand body nuclei or initial irregularities, such as ebb-tidal deltas) and the subsequent hydrodynamic reworking of the nuclei (e.g., McBride and Moslow 1991), which eventually led to two generic classifications (Dyer and Huntley 1999; Snedden and Dalrymple 1999). Recognizing that the Huthnance stability model was applicable to both storm-and tide-built ridges, Snedden and Dalrymple (1999) proposed a unified model for ridge genesis and maintenance. They classified shelf sand ridges according to the amount of reworking of the original sand body (i.e., precursor irregularity) based on sedimentologic and stratigraphic evidence. As such, ridges were subdivided into three classes representing an evolutionary progression of increased ridge reworking and migration (Table 1). Class I ridges retain all of their original nucleus (i.e., precursor irregularity). Class II ridges are partially evolved sand bodies that have migrated less than their width and thus contain recognizable evidence of their original nucleus, whereas Class III ridges have migrated a distance equal to or more than their original width, thereby eroding virtually all evidence of their original nucleus. Sand ridge genesis is most favorable during transgression on continental shelves that are characterized by the following four conditions: (1) initial irregularities most commonly developed in the nearshore zone, (2) sufficient supply of loose sand, (3) sand-transporting currents (tidal or storm-driven), and (4) sufficient time for the sand to be molded into a ridge or ridge field (Snedden and Dalrymple 1999). Some of the best developed, storm-maintained linear sand ridges and fields are located on continental shelves along North America, South America, and northern Europe. Linear sand ridges on the Atlantic shelf of the United States reside offshore Long Island, New York, New Jersey, Maryland, North Carolina, and the east coast of central Florida (Duane et al. 1972; McBride and Moslow 1991). Numerous linear shoals and banks are also found along the northern Gulf of Mexico of the United States offshore the Florida Panhandle (McBride et al. 1999), Louisiana (Penland et al. 1989), and east Texas (Rodriguez et al. 1999). Other classic localities include eastern Canada offshore Sable Island, Nova Scotia (Dalrymple and Hoogendoorn 1997); northern Europe along the German Frisian Islands (Swift et al. 1978); and South America offshore northern Argentina, Uruguay, and Brazil (Swift et al. 1978). In contrast, well-developed, tide-maintained linear sand ridges or fields are located in the North Sea around England (Kenyon et al. 1981; Belderson et al. 1982) and other embayments characterized by >3 m tidal range (e.g., Gulf of Korea; Gulf of Cambay on Indian west coast; northern delta of Amazon River; northern end of Persian Gulf; Prince of Wales Strait just off Cape York, northernmost tip of Australia) as discussed by Off (1963).